When I first started my weight loss journey in July of 2012 I didn't think I could commit to making a shake every day to replace one of my meals. I thought I would miss solid foods, and miss the foods I love most. But after my Beachbody coach told me of all of the benefits, I thought why not give it a shot. 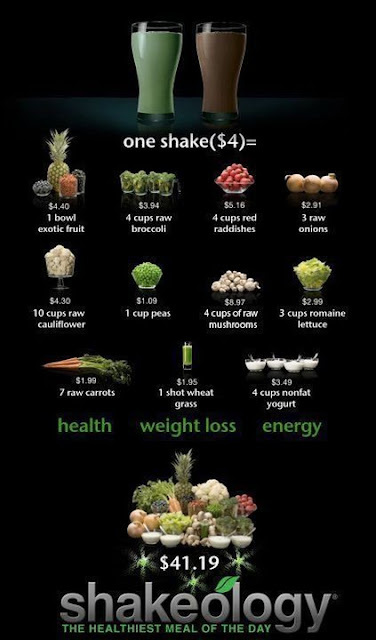 Shakeology is the most delicious, nutrient-dense, low calorie formula, superfood-packed protein shake on the planet. It contains more than 70 natural ingredients derived from rich, nutrient-dense whole-food sources from around the world. Shakeology is so incredibly healthy, no other single food item out there can supply you with all the nutrients, vitamins, proteins, and minerals in the amounts you need the way one delicious shake can. Whether you use it as a meal replacement for weight loss or simply to ensure your body gets all the nutrients it needs for optimal health, Shakeology truly is NUTRITION SIMPLIFIED. What will Shakeology do for you?? It is simply not a "protein shake" or a "weight loss shake". It is a complete nutrition shake that is a complete meal that has proper carb to protein ratio that your body needs to stay full and energized for 2-3 hrs. DUH...no brainer to give it a try! If you are interested in buying Shakeology or want to learn more, you can do so HERE!